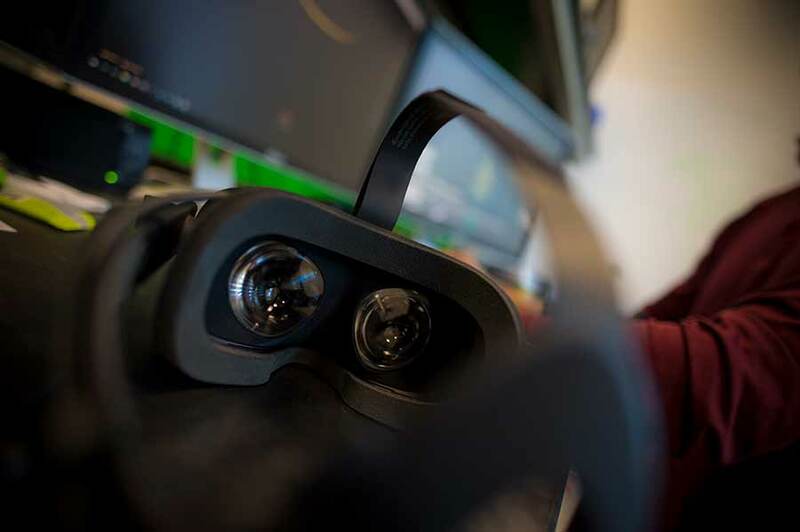 Virtual reality (VR) headsets such as the Oculus Rift will line store shelves this holiday season, and UC San Diego alumni startup Nanome, Inc. plans to capitalize on that by creating VR apps for the consumer market, the classroom, and beyond. Nanome co-founder Steven McCloskey was part of the first graduating class of NanoEngineering at UC San Diego when he received his bachelor’s degree in 2015. Frustrated by the lack of tools available to nanoengineers for complex 3D modeling and simulation at the nanoscale, he set out to try and rectify the problem. He and colleagues built the first molecular visualization, modeling and simulation tool for today’s VR platforms called nano-one. The application allows users to build molecules with carbon, oxygen, nitrogen and hydrogen atoms. Nanome co-founders Keita Funakawa and Steven McCloskey would take advantage of many of the resources available to entrepreneurs at UC San Diego, such as programs at the Jacobs School of Engineering von Liebig Entrepreneurism Center, which is now part of the Institute for the Global Entrepreneur, and The Basement. They also joined the Calit2 Innovation Space and Pepperhouse Incubator, and won the Entrepreneur Challenge, as well as Triton Entrepreneur Night earlier this year. During this time, McCloskey was taking classes through UC San Diego Extension, where he met Visual Arts Professor Benjamin Bratton. Bratton was impressed with the project, and offered the team space in his Design and Geopolitics Lab, where they continue to develop their products today. Why VR? Everything is made out of atoms—cosmetics, computer hardware, everything. Take a chair, for example. A chair can’t just look like a chair, it has to act like one. If you’re going to be manipulating things in 3D, you also need to be able to change the material properties of an object, which is dictated by structures at the nanoscale level. McCloskey said he believes nanoscale virtual reality represents the future of engineering. 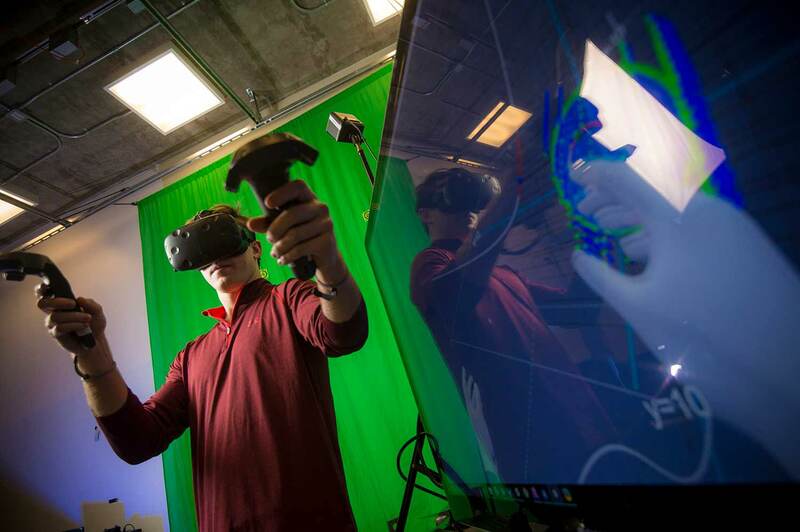 “UC San Diego is where this has to happen—we have a NanoEngineering department, VR experts, Protein Databank, interdisciplinary researchers, and we’re located in Biotech Beach,” he said. Nano-one is now being tested in the UC San Diego Chemistry Department and in the consumer market for workflow integration, modeling precision, and optimal pattern-recognition and discovery. As nano-one was being developed, McCloskey and his colleagues had an idea for another VR tool that would help engineers with math. “When I was in Vector Calculus as a NanoEngineering major, I wanted better 3D graphics to go along with the instruction,” said McCloskey. The team piloted a VR 3D-graphing calculator in Math20E over the summer. The calculator, called Calcflow, features intuitive ways for students to learn the foundations of vector calculus. If all of this sounds like another language to you, the calculator also features presets and sample problems, and allows users to take notes within the program. Nano-one and Calcflow launched in the STEAM store (VR equivalent of an app story) Nov. 10, and are finalists for CONNECT’s Most Innovative New Product Awards in December. 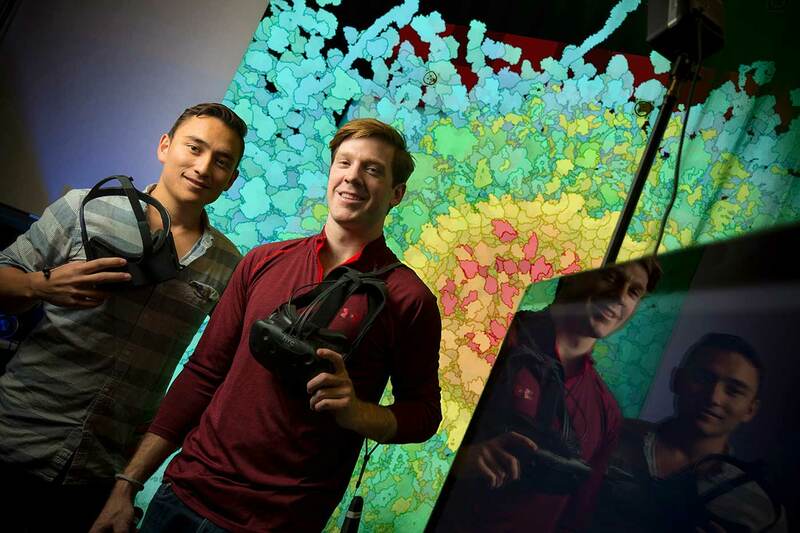 At first, McCloskey thought about creating a video game to help nanoengineers visualize their research, but then he came across the Oculus Rift. At the same time as McCloskey was toying around with the idea of VR as a tool for nanoengineering, Funakawa was innovating in another field. Funakawa and McCloskey found this common ground in April of 2015 at a film festival put on by UC San Diego’s ArtPower, where McCloskey was demonstrating an early stage prototype of a virtual lab that he built with a few of his classmates. “Once I saw Steven’s VR demo, I was hooked,” said Funakawa. Nanome incorporated in August of 2016 and has grown to a team of three developers and nine interns. Now, they are looking to customize their tools for industry.